Need a simple to use video editing software to start making videos to save the best moments of your life? Check out this list of top 5 best video editing software for novices in this roundup! Editing videos is not a complicated process if you are not going to produce blockbuster Hollywood films, TV Shows or professional music videos. It can be done easily even if you are a novice. The process is as simple as you tell a story about what’s happening in your ordinary life. The video can be a series of your kids actions or your pets playing with a ball. Everything in your real life can be transformed into stunning videos by using a video editing software. Easy to import raw footage into the editor. Intuitive timeline editor so that they can easily cut, trim or crop videos quickly. Possible to apply transition effects to that you can switch between scenes smoothly. Adjust the color of the video (so called color grading). Okay! Let’s getting started now! First thing first, Filmora Video Editor is simple-to-use yet decent video editing software for novices on both Windows and Mac. It has an intuitive user interface and a smart editing workflow that anyone can learn to use it quickly. In Filmora, you can quickly import your video into the editor by drag-n-drop, cut, trim and crop videos simply with the editing tools on the timeline toolbar. Once you are done with cutting and trimming, you can apply transitions and special effects to your videos by doing the same things (drag-n-drop). To help you understand deeply about Filmora video editor, we’ve written a very careful review about it here. Please read it before you download the program to use. Cut, trim and crop videos quickly. Apply filters and transitions easily. Possible to add text title to the video as well as music background and so on. Split video screen into parts, blur area, detach audio, camera shake remove tool, Chroma key, screen recording tools and more. Export video in full high definition quality and support 4K editing. Possible to share your video directly to YouTube and other sharing channel. To use Filmora video editor, you’ll need to download the program, register a Filmora account to start your editing work. You can use Filmora Video editor for free but there will be a watermark on your outputs. To get rid off the watermark, you need to consider to buy Filmora Video Editor at $59.99 for both Windows and Mac. Camtasia has been known as an industry standard in making video for training and marketing for years. This is no doubt one of the best video editing programs novice users must try. Editing videos with Camtasia is as easy as Filmora or any other timeline video editors you find on the market now. The only downside of Camtasia is its price tag. If you are an individual video editor, I suggest you ignore this program because there are still other cheaper programs in the next parts of this article. For business, Camtasia is a great option to go. You’ll have 30 days to try the program as trial. Our Camtasia 2018 review is available here! Camtasia 2018 provides a New Library, higher video rendering speed, edit video in 60fps and free assets of videos and audio. Edit video in 60 fps and free assets of video and audio. Possible to cut, trim, crop, split and merge videos easily. Apply transitions and color effects to video simply. Export videos and share directly online. Camtasia is available to try 30 days only. After 30 days, you can’t use the program any more. All the outputs in trial period will be watermarked. 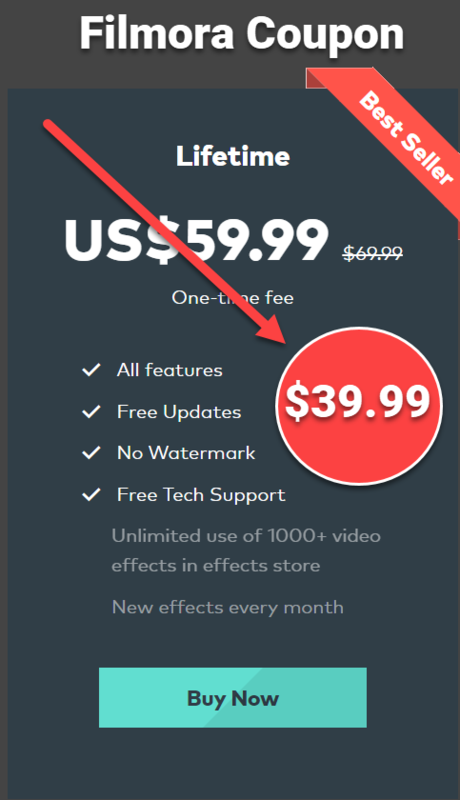 To remove the watermark, you’ll need to purchase a license at $249/ lifetime. View pricing detail here! VSDC free video editor is a powerful editing program that any novice should use to start their editing work. This program is an amazing free video editor with all necessary tools for transforming your footage into engaging videos with dozen of text and annotation tools. You can also easily create a slideshow from images (with background music) quickly with this editor in minutes. The best part of VSDC is that it has no watermark or output limitation and support various devices and 4K video editing. To give your more information about VSDC, please read our detail review of VSDC free video editor here! Has all necessary tools for editing video up to 4K. Record video on the screen for free, no watermark. Quick tool for creating slideshow from images. Export video into various formats without watermark. Great performance and high quality output video. VSDC is a little bit hard to use if you are new to it. After some hours learning the program, you can start your editing work perfectly. It is only available for Windows. In order to increase video rending speed, you’ll need to upgrade to Pro version at $19.99. Magix VEGAS Pro 15 is an awesome video editing program novice filmmakers should try. Despite the fact that its price tag, $399 is something you must not ignore at first sight. This is a powerful video editing program, designed for professional post production. If you are going to take part in Hollywood film making industry (or at least want to know how a professional film editing software look like), Magix VEGAS Pro 15 is a great start. Like other pro level program, VEGAS Pro 15 give you 30 days trial only. Within this period, you can only produce a video shorter than 2 minutes (with no watermark). In order to product longer project, you’ll need to buy pro license at $399. We also wrote a careful review about Magix VEGAS Pro 15 here. Take a look! Flexible and customizable interface that is really helpful for beginners. You don’t need to learn a new layout, just drag and drop its toolbar Windows to your favorite position. Affordable price for professional editors and Studios. Great effects and transitions package. Various input/output format support: HEVC, ProRes, AVC..etc. No watermark in free trial period. MAGIX VEGAS Pro 15 license price -$399 includes $200 discount and Boris Continuum image Restoration ($299 value) and proDAD Mercalli V4 ($199 value). This special offer is valid until July 18th only. We don’t know if you have to pay more after this deadline or not. View pricing detail here! Free trial period is 30 days. Last but not least, I strongly recommend YouTube video creators and marketing video producer to use ActivePresenter, a powerful and all-in-one program for such kind of work. It’s not so important whether you know about it before or not since the program is very simple-to-use and easy to learn. If you have been familiar with MS PowerPoint, you will quickly overcome the learning curve of ActivePresenter in minutes. In ActivePresenter, you can cut, trim, crop, split and merge video, adjust audio, speed up and low down video speed, apply Chroma key, add text title or subtitle to video, zoom and pan video, split the screen, add low third video and many thing more. Everything is free in one package. Read this review to understand more about ActivePresenter. High quality screen recording tools for recording video on the screen. Editing video with cut, trim, crop, blur, split and merge video as well as other advanced features such as Chroma key, Text-to-speech, Zoom and pan, Animate texts, customize Java Script and more. Add special annotations to video quickly. Export video into MKV, MP4, AVI, WebM and HTML5 outputs. ActivePresenter is completely free and can be used for non-commercial purpose. There is no watermark on the output, except the HTML5. For commercial usages, you’ll need to purchase ActivePresenter Standard license at $199/ lifetime. ActivePresenter Pro Editition – $399 is suitable for creating e-learning courses only. If you only produce YouTube videos or training videos, you don’t need to buy this edition. Editing videos is exactly something that you can learn in minutes even if you are novices. It is just a procedure of video assembly and applying transitions. However, to produce a professional stand-out videos, you’ll need to invest time and money on your work. Starting your editing career with one of the above mentioned programs is not a bad choice. I hope you enjoy the post and thanks for visiting us. If you have any question, don’t hesitate to ask in the comment section. We’d love to hear from you. Don’t forget to follow us to receive more valuable post notifications in the future! Amazon Prime Day Deals 2018 Start Now – Read This First!